Be honest, if Chris Tarrant approached you in the street a year ago, in an attempt to rekindle flickering interest in his quiz show and said to you; “I will give you a million pounds if you can name one band who will flounder miserably after their first album?”. 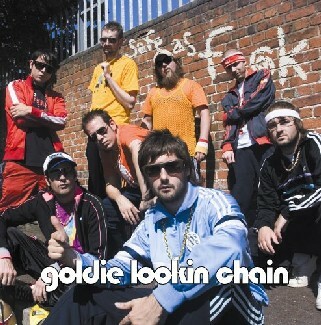 You would have had no compunction in naming and shaming the whacky Welsh rappers GLC. However, on one listen of this album Chris Tarrant would just utter the words; “You have just lost a million pounds; the correct answer was The Kaiser Chiefs”. “If you wanna make money then you gotta think fast, phone Claims Direct cos there’s a nail in your arse. A montage of wacky pictures decorates the inner sleeve of this offering that resembles what it would be like at Pete Doherty’s stag do. This gives an added dimension to the weird, fun and frolicking world of this refreshing and bubbling outfit.